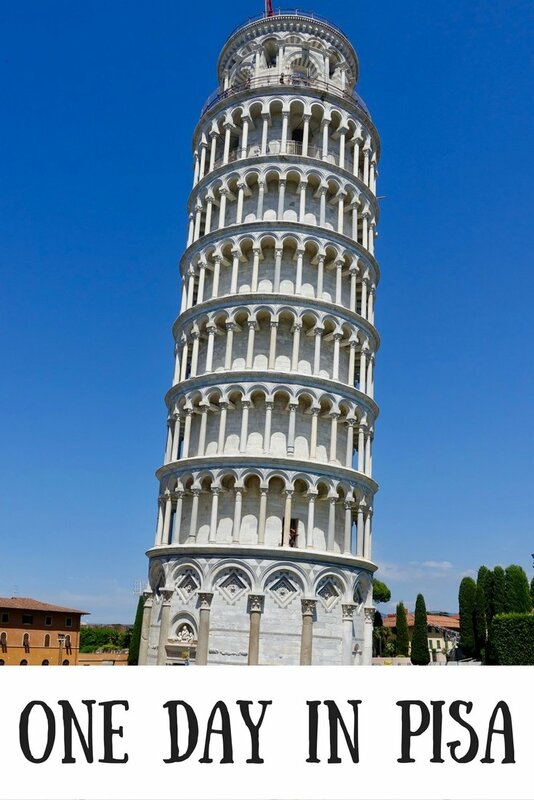 As soon as Pisa is mentioned, it’s famous leaning tower is the first thing that comes to mind. In fact, many times when I mentioned travelling to Italy, it was the first place people asked me if I was going. 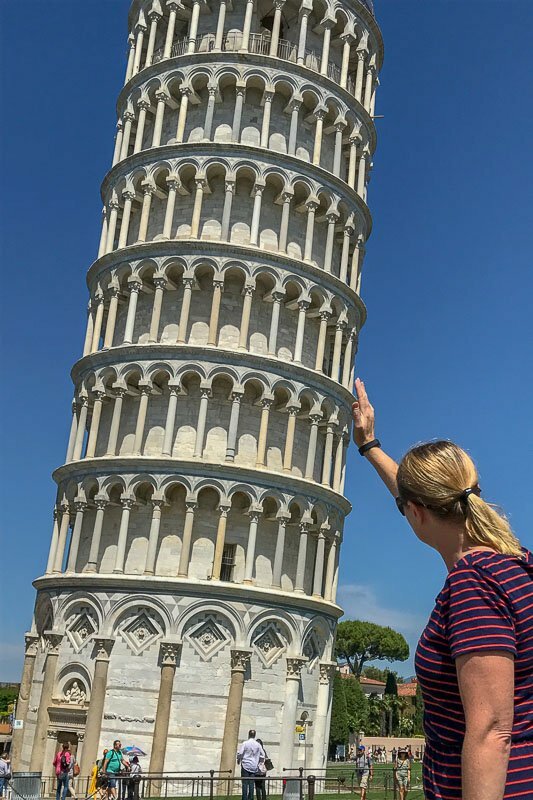 Clearly I had try to include one day in Pisa in my itinerary somewhere – even if just for the obligatory photo holding up the tower! But are there any other things to do in Pisa, Italy? Well, honestly, not a huge amount, so if you only can be in Pisa one day, that is enough! Pisa is the capital of Tuscany, and has a population of around 90,000. It does have a few churches, castles and bridges, like most decent sized Italian towns, but none of them seem to be much visited. So we planned a quick visit to see the Leaning Tower of Pisa. Here’s what we found during our Pisa day trip. Pisa is ideally located in Tuscany. 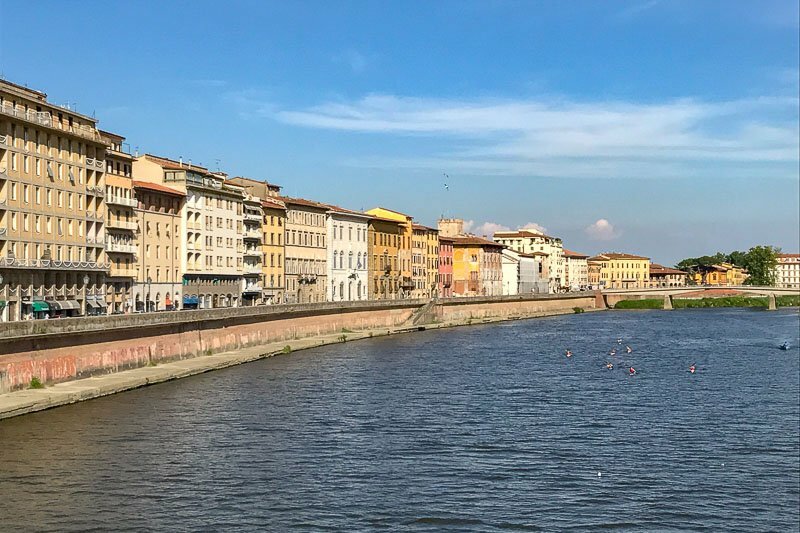 If you don’t want to stay in Pisa, but still want to see the Leaning Tower, it is perfectly doable as a day trip from many other towns in the area, most notably from Florence. Full day and half day in Pisa tours can be booked through many tour operators. Here are just a few options that include Pisa in a day. If you arrive in Pisa by train at the Central Station, walking straight outside will bring you into the Piazza Vittorio Emanuele II. Grab yourself a quick coffee in one of the cafes and ready yourself for your day. Once in Pisa it’s a easy 20-25 minute walk straight through the middle of the city to get to the Piazza dei Miracoli, home to the Leaning Tower and some of the other Pisa attractions. We meandered along and took a bit longer than this by stopping and getting a coffee at one of the many little cafes along the way. We were also looking out for other things to see in Pisa we hadn’t heard about yet. As you make your way from the train station to the Leaning Tower, you will pass over the Arno River, with some lovely architecture on either side to admire. Holding up the Leaning Tower of Pisa! I just had to do it! As soon as you arrive you will be drawn to the Tower. It is not crammed between other buildings as many other Italian landmarks are, but out in an open green area with one or two other buildings. There will be a lot of other people around, but there is plenty of space for everyone. The Leaning Tower was originally built in the12th Century as the bell tower for the neighbouring Pisa Cathedral. It started to sink immediately, and many things have been tried over the years to straighten it. If you look carefully at the very top section, you can see it is not on the same angle as the rest of the building. It was added on in the 14th Century. It is possible to climb to the top of the tower for €18. There are a maximum of forty people allowed inside at any one time to help with the preservation so there can sometimes be quite a wait. 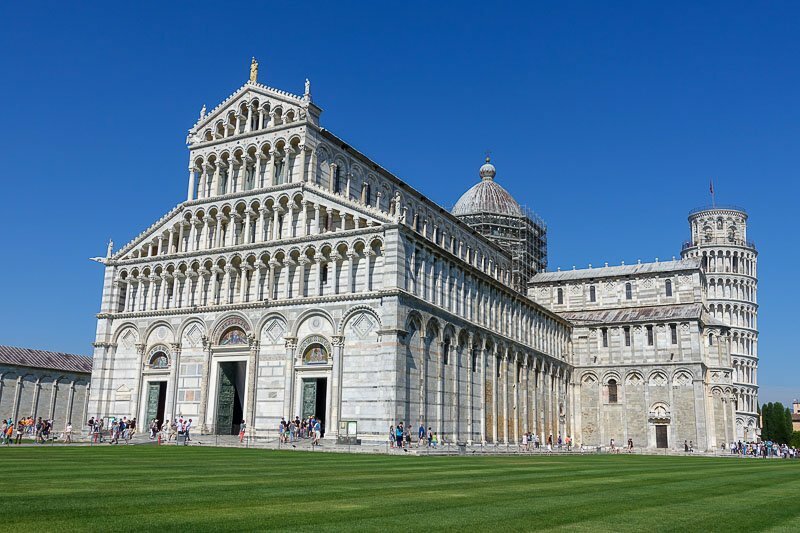 Once you have finished marvelling at the tower and getting that shot holding it up, the question is “What to do next on my Pisa one day itinerary?” There is no doubt you will have noticed the other gleaming white buildings so it’s time to have a look. There are many different ticket options available, so you can choose to visit either 2, 3 or 4 of the surrounding buildings. We chose to visit all four for €8 – the Cathedral, Baptistery, Camposanto and the Sinopie Museum. Leaning Tower of Pisa Entry Ticket – this skip-the-line ticket will allow you to climb to the top of the Leaning Tower. 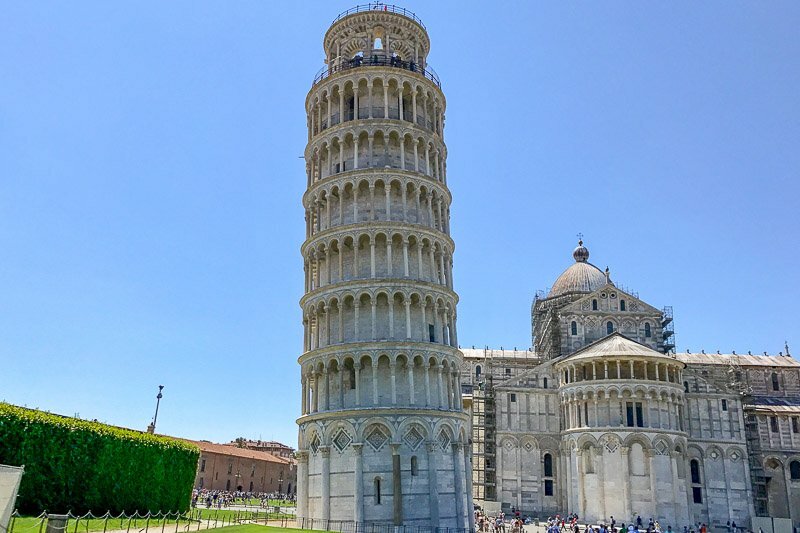 Explore Pisa City with Skip-The-Line Leaning Tower Climbing – this is a guided walking tour of the city that also includes a visit to the Leaning Tower. 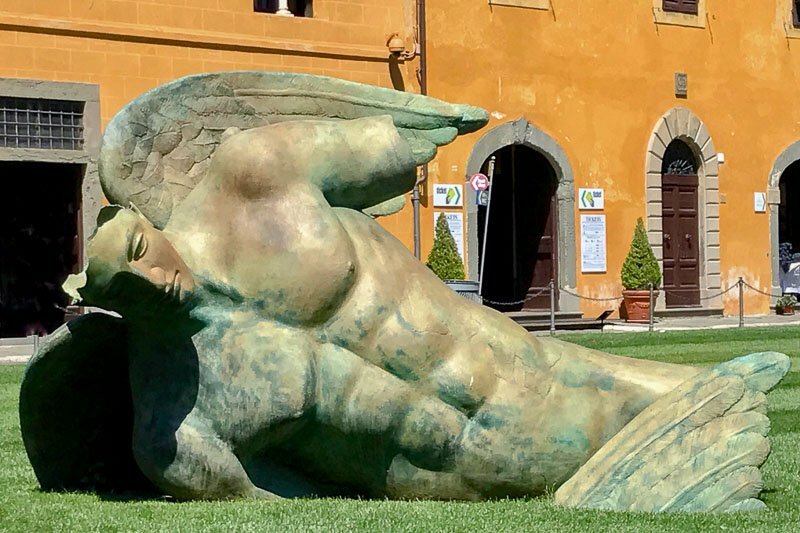 While you are buying your tickets, take a moment to look at “The Fallen Angel”. Pisa Cathedral with the Leaning Tower in the background. Entry to the Cathedral is at the opposite end to the Leaning Tower. There can be some lines, but we were lucky to find no one waiting when we entered. 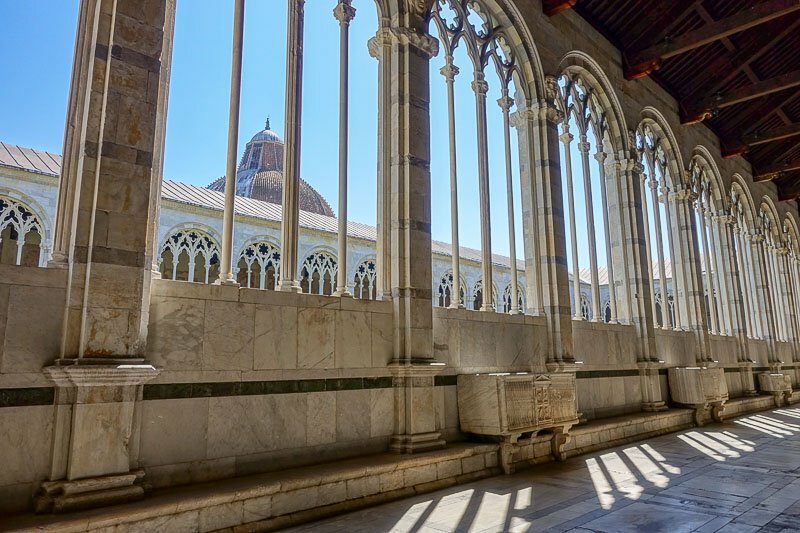 Budget Tip: Entry to the Duomo is actually free, but if you don’t buy one of the other tickets, you will need to book a time slot at the ticket office. There are only a limited amount of free entry coupons issued per time slot, so get a time as soon as you arrive. Other paid tickets will allow you to enter at any time. I have to admit I have a bit of a thing for churches. While I am not religious, I find these places fascinating. I love the intricacies of the statues and the overall serenity. If there are stained glass windows, then I am completely taken! The Pisa Cathedral did not disappoint. It had that feel of reverence to it. It feels larger on the inside than it looks, with the towering ceilings and echoes. As always there was an area off to one side which was open for worship, and it is possible to enter than area for free through a seperate entry if thats your purpose. Our next stop was the Camposanto. Built back in the thirteenth century, basically this cloister-like building is a big cemetery. The whole floor is covered with rectangular plots under which important people were buried. It is still used today, and we saw some burial dates as recent as the last ten years. The Camposanto. Each one o those rectangles on the floor covers the burial place of the person written on it. There are some interesting frescoes on the walls, and quite a few statues and sarcophagi on display too. Some smaller chapels off to the sides held religious relics. Most of the text on the floor slabs is difficult to read, either in Italian or some other older script. There is little in the way of other information available to the casual visitor. If you are interested in more information, I think a guide for the Camposanto would provide a fascinating insight. At the opposite end of the Cathedral to the Leaning Tower is the Baptistery. Unsurprisingly, the Baptistery is also on a slight lean towards the Cathedral, but nowhere near as bad as the Tower. From the outside it is a stunning domed building, probably the most interesting of all. The inside though was quite plain, with the most interesting aspect some small stained glass windows. It is possible to climb up to the second floor balcony to look down on the pulpit from above. There is also a great view towards the front of the Cathedral from up here too. 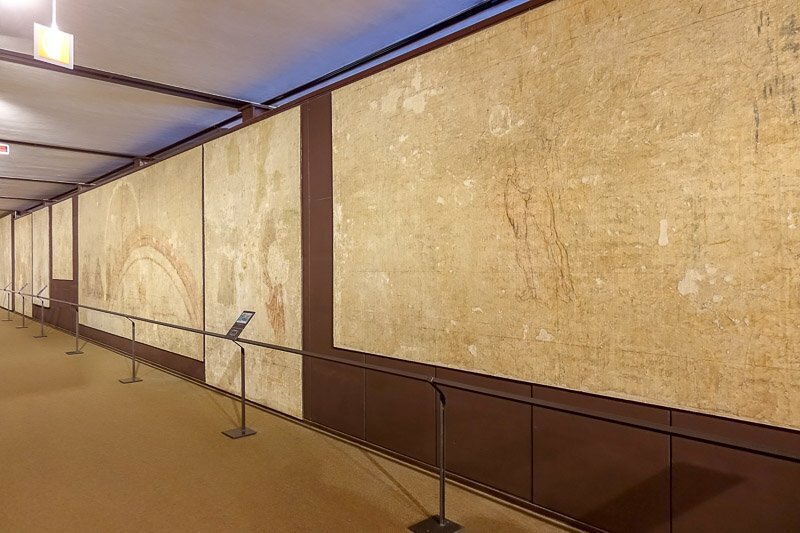 The Sinopie Museum basically houses the “rough drafts” of many of the frescoes in the Camposanto. We were also able to rest for a few minutes while watching a video about the building of the Leaning Tower and the different modifications made since to try to hold it up. Unless you are particularly interested in the artwork, this will only take a few minutes to browse through, with a little longer if you want to watch the video. All up 30 minutes is all that is required here. Anything Else to Fill up Your One Day in Pisa? Still looking for what to do in Pisa in one day? As we walked back, we came across the Orto e Museo Botanico di Pisa (botanical gardens). We didn’t go in, but saw afterwards that these are possibly the oldest botanic gardens in the world. 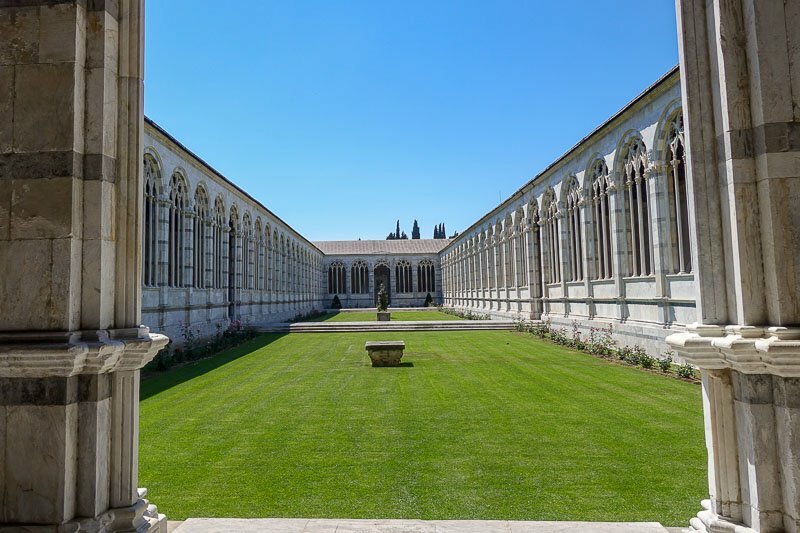 (The other claimant is Padua, started one year later, who say that they have the oldest gardens since the Pisa ones have moved location. I actually tend to agree, since a garden sort of has to be in one place, or it’s a new garden, even with the same name.) Entry to the gardens is €4 per person. 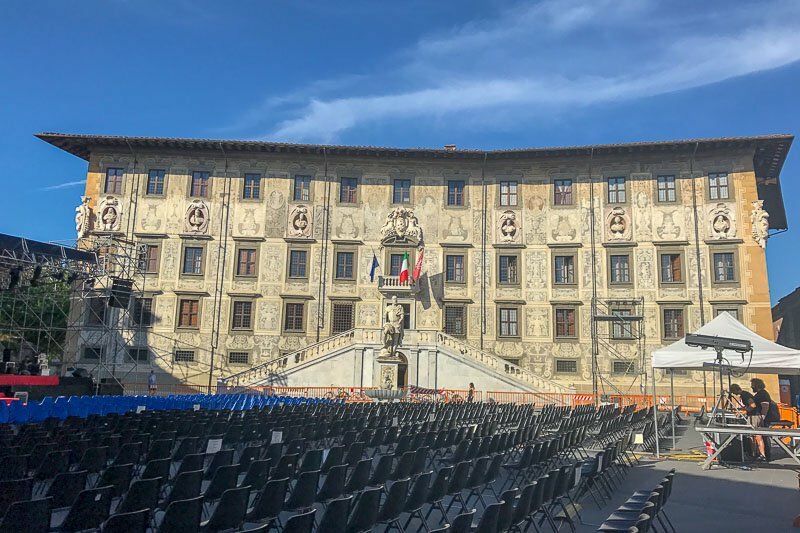 If possible, take a small detour off the main thoroughfare to have a look at the other piazza of Pisa, Piazza dei Cavalieri (The Knight’s Square). There are a few other nice buildings to admire, and a nice space to relax in. When we were there though it was not so relaxing as they were setting up for a concert that night. Perhaps check if there is something on while you are in town that may be of interest. Take a stroll along the banks of the River Arno and pay a visit to the cute like gothic Church of Santa Maria della Spina. This 13th century church was the original home to a thorn that originally came from the original “Crown of Thorns”. 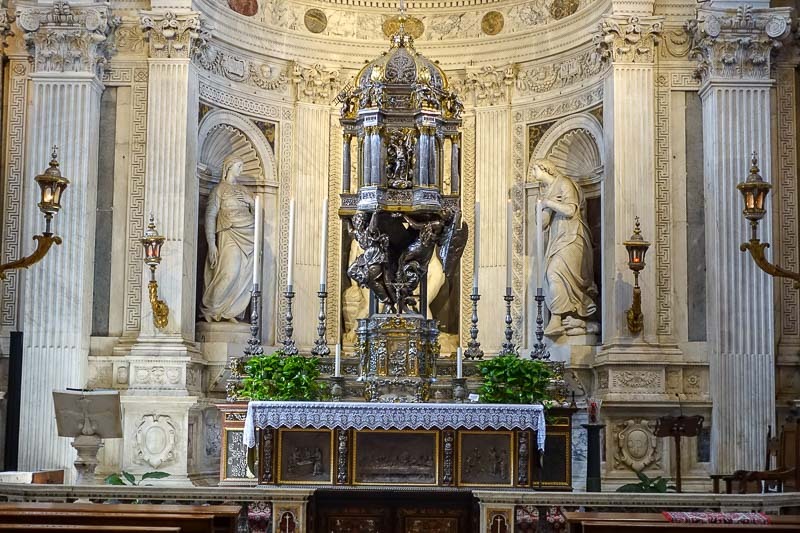 The thorn has since been moved to the nearby Chiesa di Santa Chiara (on Borgo Stretto) if you want to have a look. There is one more significant church in town, the Basilica Romanica di San Piero a Grado. It’s located a little out of the town centre though, so you will need a taxi to visit this one. 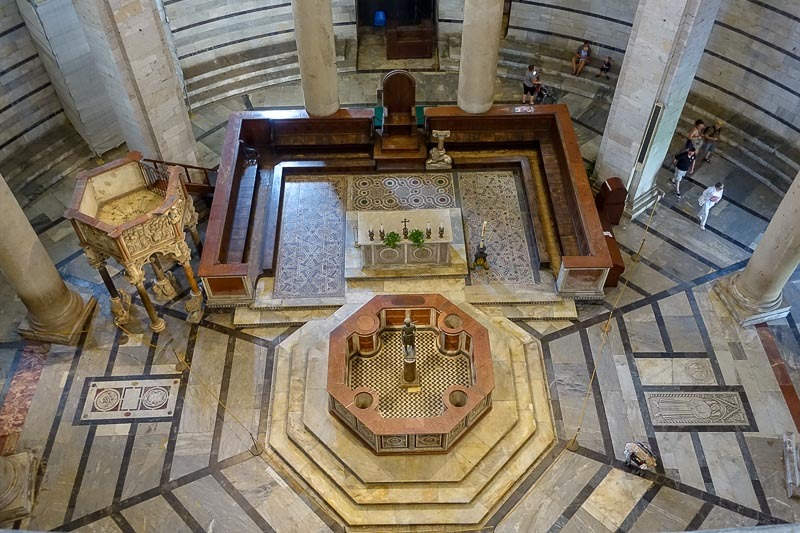 It’s located in the place where St Peter is said to have come ashore on his journey to Rome. 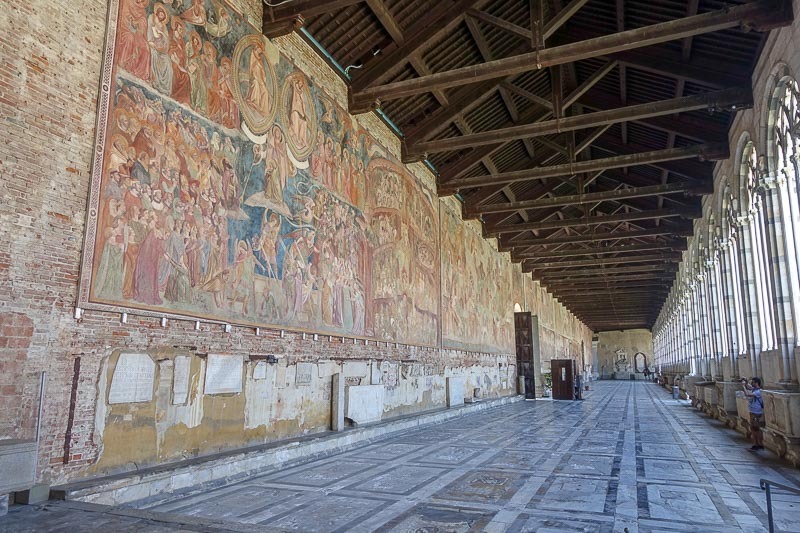 In the 14th century the inside of the church was decorated with many frescoes commemorating St Peter’s pilgramige which can still be seen today. Walk in the other direction to the Church of Santa Maria della Spina and cross the Arno and you can find the Museo Nazionale di San Matteo (National Museum of San Matteo). Housed in an old Benedictine convent, the museum has a vast colletion of medieval works, including painting and sculptures, manuscripts and ceramics. If you enjoy Italian art, you may also like to visit Palazzo Blu, another art museum filled with 14th Century Italiam art. Look out for the blue building it is housed in. For shopping in Pisa make your way to Corso Italia, for some great local brands as well as some market stalls to pick up your souvenirs. If you are looking for nightlife, head to Piazza Garibaldi. The square is full of cafes during the day that turn into bars in the evening. My suggestion is to make sure you walk a little away from the Piazza dei Miracle to find food. Only a street or so back you will find better food for a cheaper price. We were tired and a little lazy, and ended up eating at Bar & Food 62 on the main thoroughfare at Via S.Maria 62, Pisa. They had a deal for €10 including a starter, main and drink. There were limited options for each course, but since I tend to eat margarita pizzas everywhere and that was on the menu, this was a good option for us. I had bruschetta for the starter, and a glass of wine. This meal was nothing special, but it was good solid food, so no complaints either. For a snack, stop by Gelateria de Coltelli, one of the best places to go in Pisa for gelato. Try some of the lesser known flavours they make from their menu that changes every day. Another place recommended by the host of our B&B was La Cereria, Via Pietro Gori 33, Pisa. It sounded fabulous, and if we were there another day we would have checked it out. If you try it, I’d love to hear your opinion too. It was well worth stopping for 1 day in Pisa. Seeing the Leaning Tower in itself is worthy of a visit. The whole Piazza dei Miracoli is beautiful, and while really popular, there is plenty of space so there is no feelings of overcrowding. There will even be somewhere you can get that crazy photo you have travelled all this way here to get! Looking for more things to do in Italy? Have a look at my other Italy posts for inspiration. 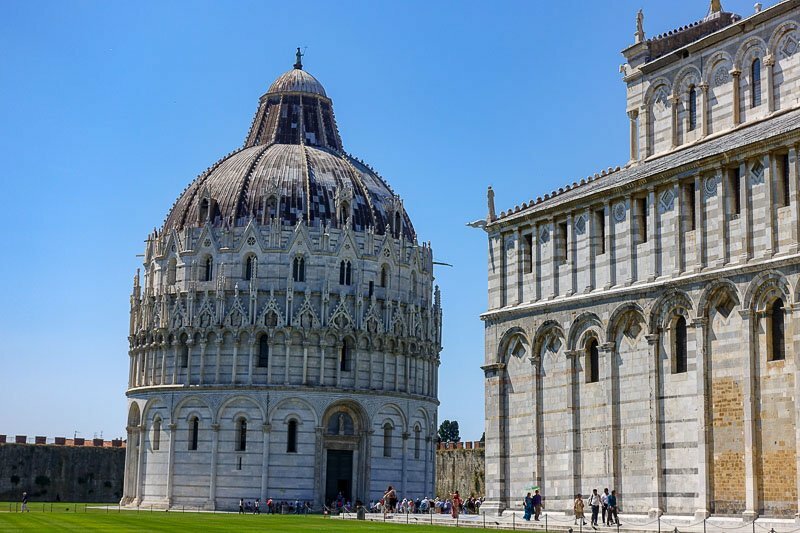 My Tour to Pisa only covered the Leaning Tower, and a walk around the outside of the Cathedral, Baptistery and Camposanto .. so I enjoyed seeing photos from the inside. Thanks Carol. I think so many tours only look at the Tower! The other buildings are not bad from the outside, but it’s also nice to look inside. The Camposanto particularly is more impressive inside. Thanks! I’ve often wondered what else there is besides the famous tower. There’s a lot to be said for being in ANY Italian with a history. And even just a plain Italian meal with a glass of wine is a feast. These people have been doing their stuff for a very long time, and the good bits tend to endure. I’m with you on the botanic gardens. This is my garden here in Canberra. We moved here five years ago from another suburb, and before that it was in Brisbane. So it’s over thirty years old. Lots of handy info here. I’m planning to head to that region in the not too distant future. Thanks Jade. You will not be disappointed, its a fantastic area to visit. There really is something for everyone. Italy is so beautiful isn’t it! I’ve only visited Venice and the ski slopes and I’m really keen to see some more of the country. Pisa looks like a great city to check out! Italy is great! We were only at Venice a few days ago, and I liked it a lot more than I thought I would! Still have a look at the Tower, but yes, then you should be able to easily escape the crowds. Thanks for reading. I have heard so much about the place. You have given a lot of information here. I like the cathedral so much! Thank you Amrita. I hope you get to visit one day. I have really wanted to visit Pisa for a long time now. Many people say that there is nothing else to see really than the tower, but even your photos prove that there is. So many beautiful building and villages close by. Thanks Paula. There are so many places in the world we all try to get to! I hope you make it to Pisa some time soon.